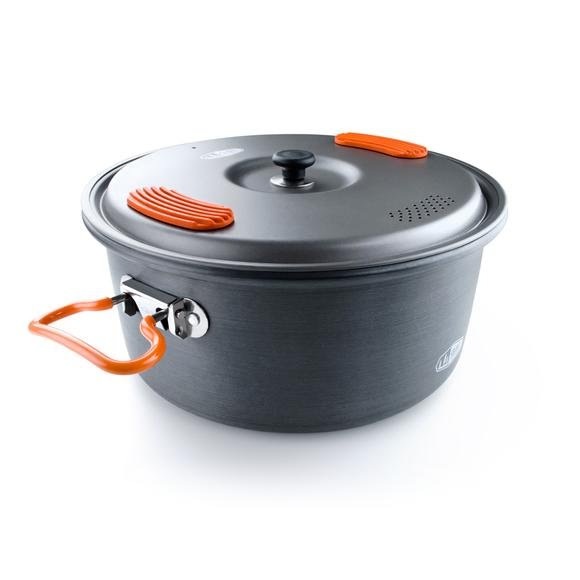 Halulite hard anodized aluminum provides superior conductivity to titanium while still being incredibly light meaning that this 2 liter pot cooks more efficiently so you can go farther and carry less fuel. The integrated silicone thumb pads on lid make straining pasta safe and secure. Thank GSI! Halulite hard anodized aluminum provides superior conductivity to titanium while still being incredibly light meaning that this 2 liter pot cooks more efficiently so you can go farther and carry less fuel. The integrated silicone thumb pads on lid make straining pasta safe and secure. Thank GSI !